I consider myself a fan of Star Wars. I’m not rabid (I’ve had my shots, I swear!) and I enjoyed the expanding fiction that surrounded the mythology of the Jedi. 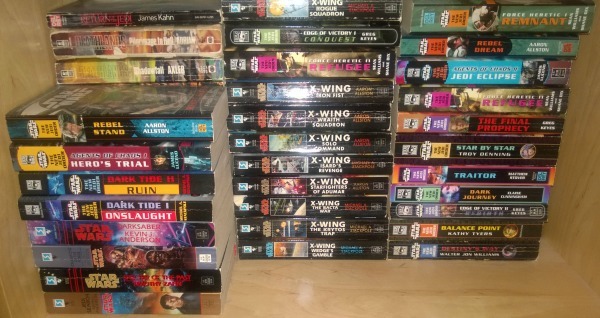 I picked up every book in the expanded universe I could find, knowing that George Lucas had personally approved of each as canon, and that they would remain true to each other. I can’t even tell you how many times I’ve re-read the X-Wing series coauthored by Michael Stackpole and Aaron Allston. Missing from this photo is the Thrawn trilogy by Timothy Zahn. I loaned these to a friend of a friend a few years ago and never got them back (cry). Imagine my surprise when George Lucas sold Star Wars to Disney and the first they did was, you guessed it, declared the entire expanded universe of books, comics, graphic novels, manga, and (gasp) fan fiction as non-canon. Only Episodes 1 through 6, the Clone Wars (animated series), and Rebels (animated series) would remain as part of the world going forward. I struggled with this, because like so many others, I expected Episodes 7 through 9 would be based on Grand Admiral Thrawn’s ploy to retake the galaxy for the Empire using his superior tactical and strategic planning. In the back of my mind, I knew that George Lucas had already penned the basic storyline for these, but I had hoped, because Timothy Zahn had created a thoroughly epic Star Wars trilogy of his own. Before Episode 7 was released, I knew that two new Star Wars books had been released, but I didn’t get a chance to read them before going in to see that glorious, amazing movie. My lovely wife bought me Claudia Gray’s Star Wars: Lost Stars for Christmas. I read it back in March, but with a small baby around, I am finally finding time to put together my thoughts on this. Lost Stars is interesting because it crosses so many genres. Let me list the ones I identified as I was reading. First, and most obviously, are the science fiction and fantasy elements; this is Star Wars, after all. It is also a young adult, romance, travelogue. Yep, you read that right. This is one of the most attractive Star Wars book covers I’ve ever seen. Lost Stars starts just 8 years after the end of Episode 3 with two small children, Thane Kyrell and Ciena Ree, from the backwater world of Jelucan. Ciena was born among the nomadic valley people, while Thane was of the elite and wealthy mountain people who value their word more than their life. Thane and Ciena are inseparable until they witness the devastation of the Death Star first-hand. Thane watches as Alderaan is destroyed and, unable to fathom why a government would eradicate an entire world to prove an object lesson, defects to the Rebellion. Ciena can only see the millions of Imperial soldiers, technicians, and bureaucrats that were slain when the Rebellion destroyed that very installation. Years pass, and each time they meet, the rift opens wider and wider, until they are each sure that they will lead to each others deaths. While it wasn’t the Star Wars book I expected, Lost Stars was fun and interesting. I found myself mentally rebelling (see what I did there) whenever Gray rewrote the expanded history in a way that I was contrary to, so I had to keep reminding myself that both can exist simultaneously. One does not detract from the other, but Spice is mined from the webbing of the crystal spiders that live in the darkness of Kessel’s mines, not farmed on other worlds! Or did she mean spice in a more generic sense? Thane and Ciena were not the only characters, although they are the only points of view you get to see through. Important figures from Star Wars history periodically poke their heads in. Grand Moff Tarkin and Darth Vader are there in small capacities, as are Leia Organa (I always want to call her Organa-Solo…see how indoctrinated I am? ), Wedge Antilles, and Mon Mothma. Interestingly, Luke Skywalker is a name of mythology in the book already, which adds to the fiction of no one knowing anything about the Jedi in Episode 7. We, as viewers into this world, experience much more about the Jedi in Episodes 1 through 6 than any of the denizens of this universe do. The information we’re privvy to is absent from this book at every turn. There are events that are mentioned and speculations, but Thane and Ciena very rarely are offered the full picture that we know from our other experiences in Star Wars. Lost Stars is refreshing and fast paced. Because it is written in the format of a travelogue, each scene or chapter could take place hours, days, months, or in some cases years after the one before it. This helps to eliminate unnecessarily boring exposition from the story, but it is jarring the first time it happens. You expect it the second time, and the third, and the fourth. 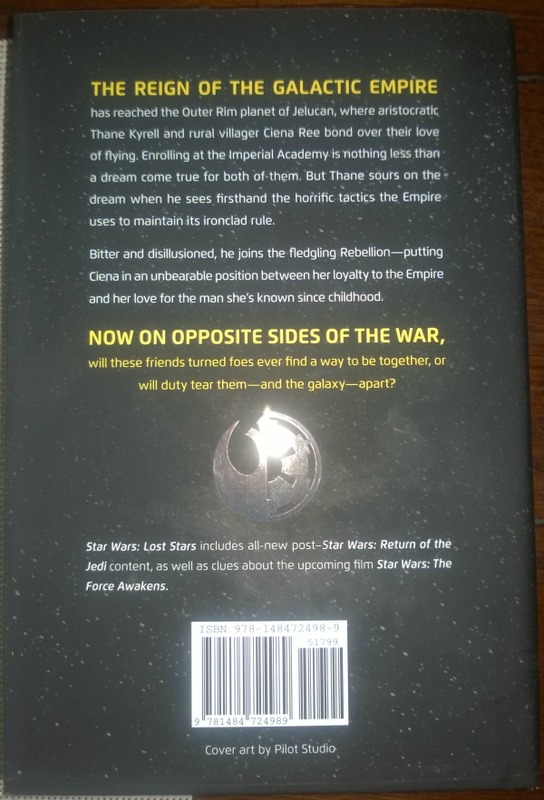 By the time the book ends, you are just a few years shy of the opening of Episode 7, and you have a clearer picture of what the normal people from the Rebellion and the Empire believe about themselves, their chances in this ongoing conflict, and the myth that surrounds the Jedi. The biggest problem with Lost Stars is that it doesn’t feel like a Star Wars story. Let me be more specific. It has all the trappings of Star Wars. It has TIE fighters, X-wings, Star Destroyers, and Death Stars. But the scope is different. Every Star Wars movie and book that I have seen or read up until now has been focused on epic, galaxy-threatening problems that can only be solved by extraordinary heroes or villains. Lost Stars isn’t that story. It is about two exceptional pilots who are otherwise normal in every other capacity and the choices they make as everything they thought they knew crumbles around them. Another major difference is time. Star Wars books tend to cover periods of days or months, ending when the current crisis is resolved and rarely offering more than a cursory glance at future events. Lost Stars starts when Thane and Ciena are 11 and ends when they’re in their mid-20’s and spans every crisis in between. Although they are not Han Solo and Leia Organa, Thane and Ciena find themselves at every major milestone along the way. 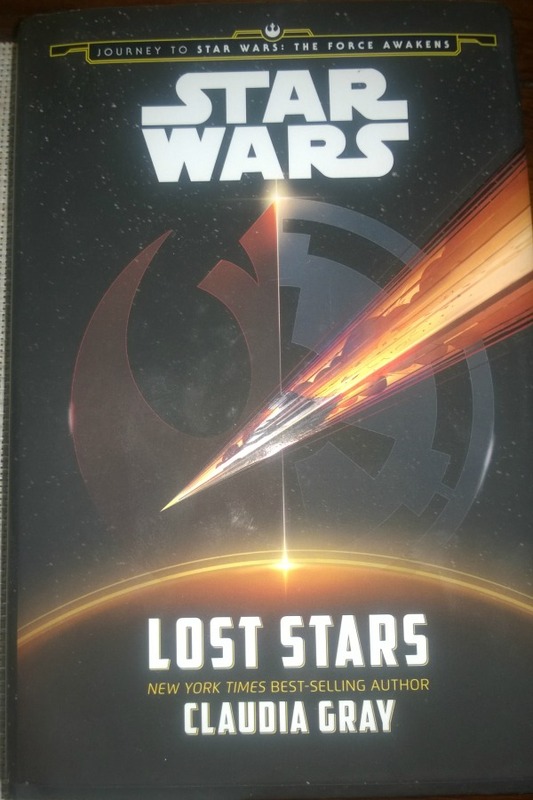 I’ll be honest, this is a book for Star Wars fans, and if you’re a fan of the movies and haven’t read any of the previous expanded universe, I would urge you to check out Lost Stars if you get a chance. For fans of the expanded universe, you’ll need to make sure you have an open mind going in, otherwise you’ll find yourselves disappointed. I don’t think this is because Lost Stars is a disappointing book. In fact, I believe the opposite. I just think that fans of the non-canon universe will have expectations of the Star Wars formula that this book blatantly ignores. If you can get past that, you’ll find this sci-fi fantasy teen romance travelogue to be refreshing and exciting. If you can’t? Well, I’d love to hear your opinion on what Gray does right and what she does wrong. You start off with “Thane was born among the nomadic valley people, while Ciena was of the elite and wealthy mountain people who value their word more than their life.” This is completely backwards. It was Thane’s family that was rich and from the mountains and Ciena’s that was poor and from the valleys. I believe this to be an important distinction because this fact is why the two met up in the first place. How embarrassing! You’re absolutely right, Thane was from a wealthy family and Ciena came from the valley. I’ll make a correction in the text of the review. Thanks for the feedback!